Born in Revelstoke, British Columbia, CANADA, Trudy Ellen Golley received her undergraduate training in ceramics at the Alberta College of Art and the University of Calgary (BFA). She was a participant in the Winter Cycle Ceramics Residency at the Banff Centre for the Arts in 1988-89 from which she went on to graduate studies at the University of Tasmania (MFA) in Hobart, Australia. She has been invited to participate in ceramic residencies, lecture, and give workshops in Canada, Australia, Denmark, China, Hong Kong and Malta. 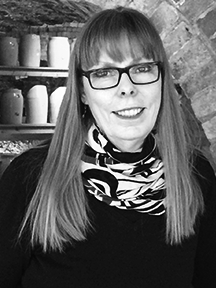 Trudy has been an instructor at the Alberta College of Art and Design, the University of Calgary, the University of Tasmania, the University of Manitoba, and the Kootenay School of the Arts. She is recognised internationally as the developer of PaperPlaster mould-making. Inducted into the Royal Canadian Academy of Arts in 2002, Golley is an internationally exhibited, award-winning ceramic artist and the recipient of grants from the Canada Council, Manitoba Arts Council and Alberta Culture. Her work is represented in numerous private and public collections, most notably; the Winnipeg Art Gallery Permanent Collection, Canada Council Art Bank, the Alberta Foundation for the Arts, The City of Calgary Civic Art Collection, Danmarks Keramikmuseum Grimmerhus, Denmark, the Jingdezhen Ceramic Art Gallery, China, and the City of Shanghai Planning Bureau (ChangShou Park). Trudy is the Head of Ceramics and an Instructor in the Visual Art Department at Red Deer College in Red Deer, Alberta. Trudy is available to teach a number of workshops. Please see the listing under resources. In 2007, Trudy chaperoned a group of ceramic artists to the UK who then toured with author, guide and potter, Josie Walter. The itinerary included Bernard Leach's studio in St. Ives, the Gladstone Museum in Stoke-on-Trent, the Rufford Potters' Festival at the Rufford Craft Centre, the HUB Craft Centre in Sleaford, Dartington Hall Pottery, and took in the International Ceramics Festival in Aberystwyth, Wales. Studio visits included John Leach, Wally Keeler, Svend Bayer, and Jane Hamlyn. For information on future study tours, please contact Trudy directly.